The individual books of the Bible, written out with an extensive gloss (medieval interpretations of the text, drawn from a variety of older sources), comprised some of the most widespread, numerous, and important manuscripts written in the 12th century. This copy of Mark has an inscription of a flyleaf which reads 'Lib Hug Epi. 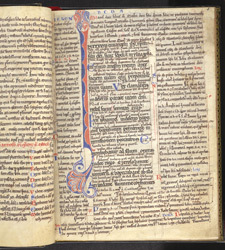 ', a shortened form of the Latin for 'The Book of Bishop Hugh', followed by the date 1154. The flyleaf also has a shelfmark characteristic of Durham Cathedral, and the manuscript can be identified in the cathedral library catalogues, so 'Hugh' must be Hugh de Puiset, who was bishop of Durham from the end of 1153 until his death in 1195. This page shows the start of the main biblical text of Mark, in larger script in the middle column, surrounded on all sides, and between the lines, with glosses. The sources of the glosses are sometimes given in red or (unusually) blue: 'Ier.' is short for Jerome, 'Be' is short for Bede, and so on.